No, that headline is totally not what it sounds. 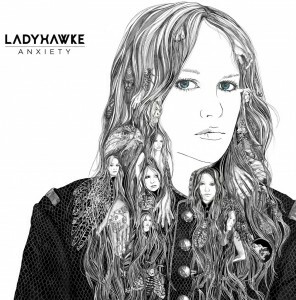 Kiwi native Ladyhawke, who’s been performing to sell-out audiences in both Sydney and Melbourne in recent days, has announced the impending arrival of her sophomore album. The gigs allowed her biggest fans to catch a selection of the new album tunes for the very first time, alongside some of her biggest hits from her first album (‘Paris Is Burning’, ‘My Delirium’ etc). The new LP is called ‘Anxiety’ and it was created in both France and the singer’s home country earlier this year and it’s an album that Pip is champing at the bit to set free. “I’ve made an album I’m really proud of, so I just can’t wait to start playing with the band again, and touring and having some fun. I can’t wait to get back into it,” she said in a statement. New single ‘Black White & Blue’ will be serviced to media ahead of the album’s release. ‘Anxiety’ is due to his on Friday March 16.